Spain Dominates Euro 2012 as Germany Showcases Promising Players After 24 days and 31 matches the Euro 2012 is over. It's hard to imagine that Germany would have defeated such a dominating Spanish team. After 24 days and 31 matches the Euro 2012 is over. And I've truly spent enough time this past month watching soccer. I have to say the last game, the final between Spain and Italy was remarkable. A 4:0 triumph for the best team on the planet. It's official, the Spanish national team is the only soccer team ever to win three major titles in a row. Silva, Alba,Torres and Mata scored Spain's four goals, leaving an exhausted Italian team, with some of the players in tears. More entertaining, than watching the Spanish players pass their trophy around, was watching the Spanish team walk their toddlers out on to the pitch in Kiev, wearing children's versions of their dad's soccer uniforms. It's hard to imagine that Germany would have defeated such a dominating Spanish team, but of course, part of my excitement watching the Euro 2012, was a promising group of German players. The youngest team in the tournament, under the guidance of the experienced and sympathetic Joachim Loew. They played an attractive style of soccer and they looked more attractive than any German national team in my memory, and they were nice! For sure the Germans got all the support they could get. Hundreds of thousands watched each of their games at Berlin's Fanmeile. And even German chancellor Angela Merkel scheduled a meeting with the heads of Italy, France and Spain early, so that she could fly to Gdansk and watch Germany play Greece. She jumped out her seat, cheering for every German goal and stopped by their locker room to congratulate the players after their victory. 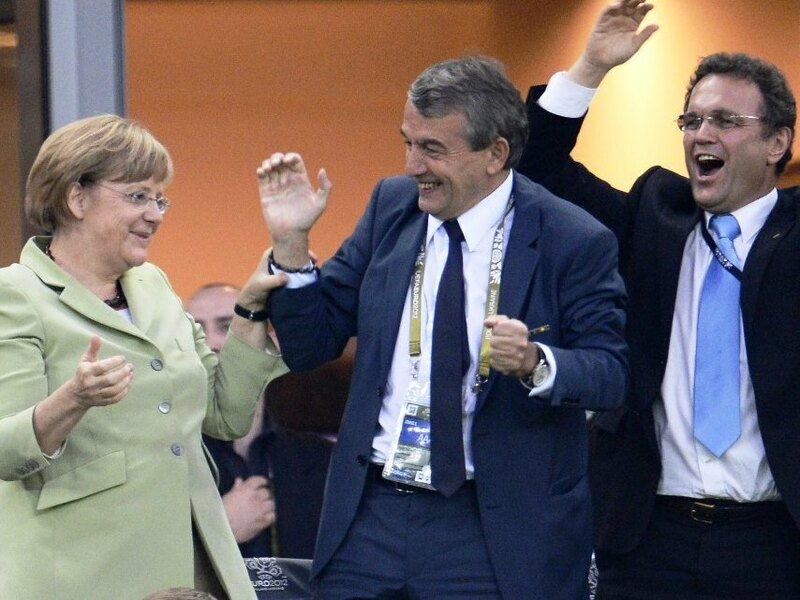 Whether you like the German chancellor or not, her joy for the sport seems genuine and endearing. It was a shock when Joachim Loew's team was kicked out by Italy in the semi-final. Maybe the German players were too nice for the hard-willed Italians. Germany has never beaten Italy in a big tournament. Now, the drama continues. The soul searching has begun, or resumes after a few weeks of thinking they had found a working formula. The once untouchable German coach Loew is being criticized for assembling the wrong starting line up against Italy. And some conservative politicians even think the problem lies with a lack of enthusiasm when performing the national anthem and are calling for singing to be a requirement. German players, Podolski born in Poland, Özil with a Turkish background and Khedira with North African roots never sing the national anthem. I think the disappointed German public should have a better sense of humor like the Irish fans, who cheered their team through three defeats. And perhaps the German players should grow beards, like some of the Spanish players and be more outrageous like the Italians. Regarding the singing, they players should decide themselves. In my mind, Sami Khedira a non-singer, fought harder for Germany than anybody else in their final match.